Because of Florida's long coastline, many people might not realize that the state is home to expansive rivers exploring Florida inland. Think about Florida and its waters, and your mind might instantly go to the best beaches on the Gulf Coast or the Atlantic Coast. But, Florida’s beaches aren't the state's only places to appreciate the water. There are hundreds of rivers covering hundreds of miles, and they each have a unique ecosystem, providing fish, wildlife, plants, and in some cases, entry to freshwater springs. Florida’s five best rivers have one thing in common. They provide plenty of recreation and beauty for active adults who live nearby. 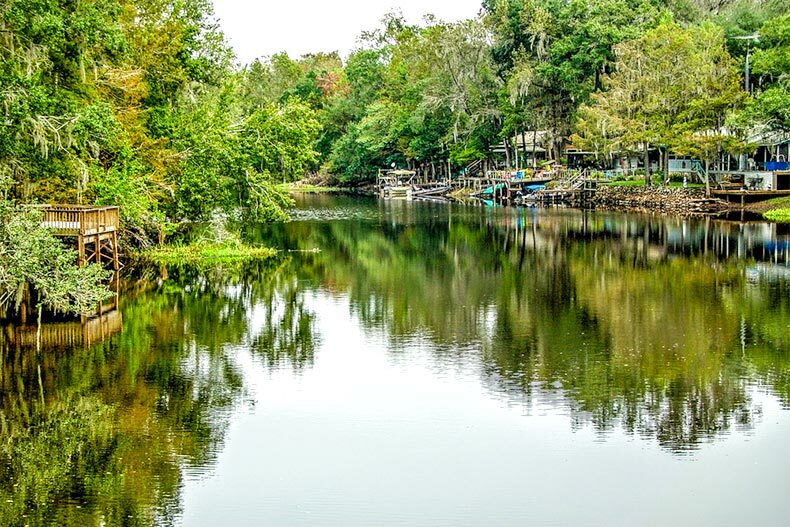 If you're looking for tranquility, the Suwannee River is a good option. A wild blackwater river that’s about 246 miles long, the Suwannee River starts in southern Georgia and winds through northern Florida before emptying into the Gulf of Mexico. More than 60 species of fish can be found in the river, including Florida gar, catfish, bluegill, and two different types of bass. Large salamanders that never leave the water are in the Suwannee, and plenty of alligators, turtles, and snakes can be found in the water and along its banks. It’s a federally designated wild river, which means its waters and habitat are unspoiled and free of any commercial enterprises. The Suwannee River State Park is in Live Oak, and it's a great place to enjoy the river by canoe or kayak. Manatee Springs State Park is right on the Suwannee, so you can walk the 800-foot boardwalk and watch sturgeon jump and splash in the water. It’s a first-magnitude spring and popular with scuba divers, snorkelers, and swimmers. 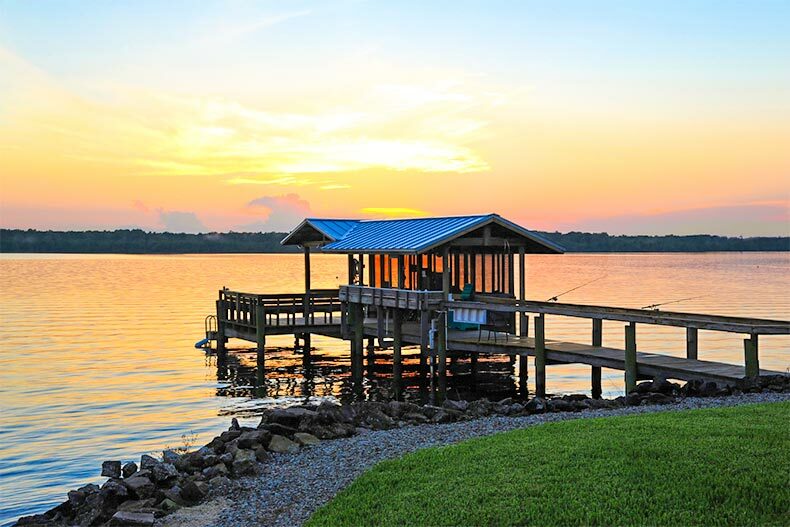 The St. John's River provides plenty of recreation opportunities, especially near Jacksonville. The St. John’s River is the state’s longest river at 310 miles. It flows north through 12 counties, starting in a nondescript marsh in Indian River County and emptying into the Atlantic near Jacksonville in Duval County. Bass fishing is popular all along this river, and the waterway supports a lot of commercial fishing and tourism in Florida. Scenic boat tours are popular. Some of the most interesting fishing spots along the St. John’s include Lake Monroe and Croaker Hole, a deep spring that’s right off the river. The St. John’s River is easy to enjoy in an urban environment on the waterfront in Jacksonville. There’s fine dining, plenty of shopping, and regular music and performance festivals right on the banks of the river against the backdrop of Jacksonville’s skyline. The Hillsborough River has secluded branches and the more popular section that flows through Downtown Tampa. The Hillsborough River starts in the Green Swamp and flows for 60 miles through three counties before emptying into the Tampa Bay. According to data from the University of South Florida, the river is 27,000 years old. Early settlers used it for survival as it provided hunting and fishing opportunities amid an otherwise difficult landscape. 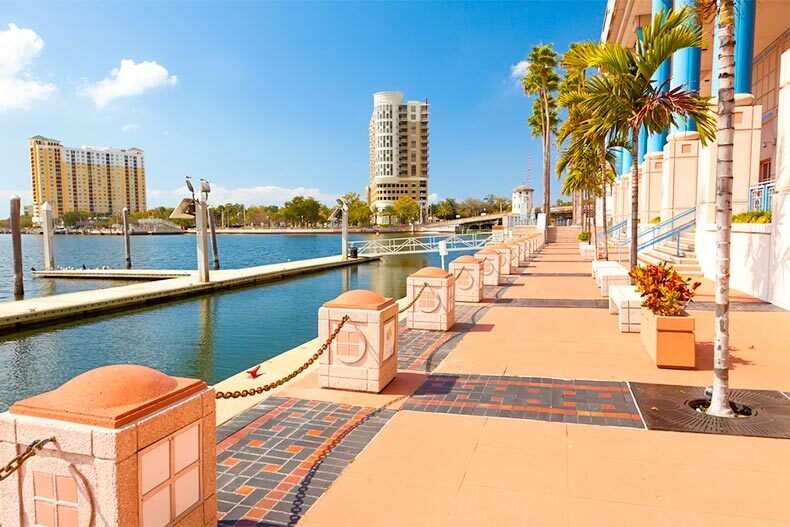 Today, it flows through Downtown Tampa where a dazzling riverfront includes restaurants, clubs, and even a port of departure for cruise ships. The Hillsborough River State Park is a sprawling wilderness just a few miles from Downtown Tampa. Hiking, camping, biking, and canoeing are all popular activities. It’s common to see deer and hear owls, and crossing the suspension bridge provides unique views of the riverbanks and the rapids. Florida's Myakka River is known for its alligators, but don't fret, they don't hurt visitors. 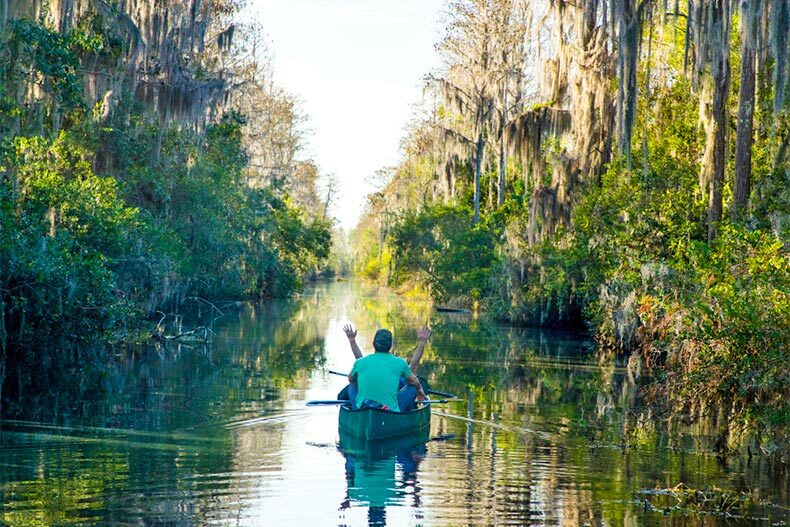 Active adults can enjoy a leisurely kayak ride down the Myakka River outside of Sarasota, but don’t mind the dozens of pairs of alligator eyes looking at you. Every Florida river has its own population of gators, but in Myakka, they’re extra-visible. This 72-mile river starts in Manatee County and flows south to the Charlotte Harbor, which empties into the Gulf of Mexico. 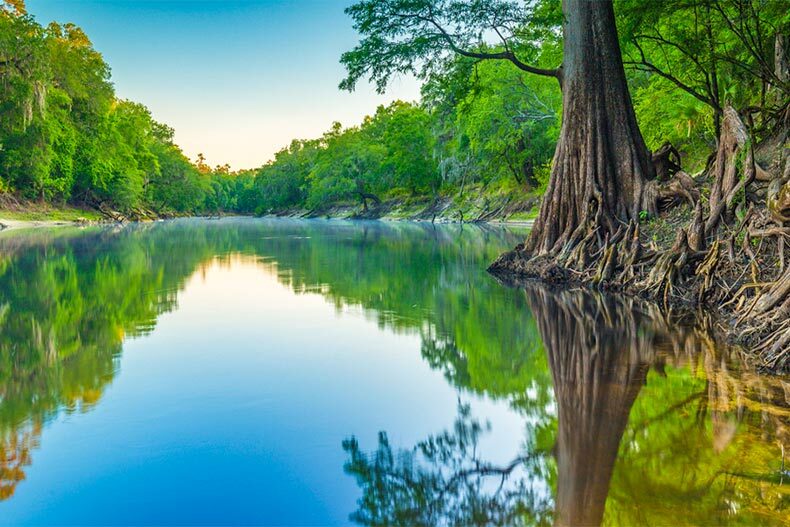 Unless you have a fear of alligators, this river is one of the most spectacular places to hike, camp, and enjoy nearly every species of Florida wildlife. 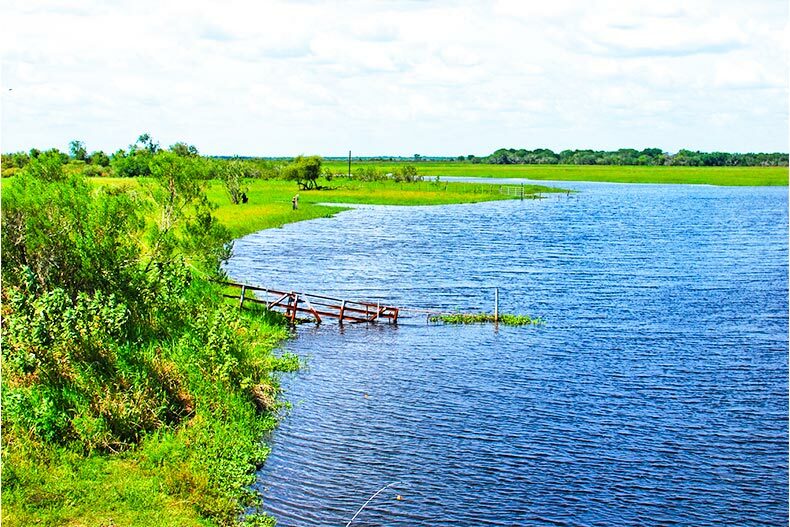 Visit Myakka River State Park, an easy exit off Interstate 75. The diversity of habitats is astonishing. One minute, visitors are in a prairie looking at wild turkeys and the next, they find themselves among wintering white pelicans and great blue herons in the wetlands. Hike one of the many trails or take a tram or boat tour around the acres of wild forest and riverbank ecology. Like the St. John’s, the Withlacoochee River flows north and like the Hillsborough River, it originates in the Green Swamp. The river is 141 miles long and flows into the Gulf of Mexico in Yankeetown, a small city along the northern Gulf Coast. It merges briefly with the Rainbow River in Dunnellon, around Rainbow Springs State Park and Lake Rousseau in Inglis. The Withlacoochee is prone to flooding, but in the dry seasons provides miles of hiking, camping, horseback riding, and wildlife viewing. Large cypress trees line its banks and in some spots, sit in the middle of the river. Some of its best points include Withlacoochee River Park, as well as the Citrus Tract and Croom Tract of the Withlacoochee State Forest. Towns along the river provide fishing expeditions and airboat rides.